Louie Bernardini is from New Gloucester and a star pitcher for powerhouse Wheaton College in Division III. He took some time to answer some questions about his career so far. Matty: It is your senior year, are you looking at this as the final season of your organized baseball career or do you feel you can contribute at another level? Bernardini: This being my final season for Wheaton I have tried really hard to slow things down and enjoy everyday I have on the field with my teammates. Looking ahead to higher levels of organized ball is on the back burner but is something I hope to be involved in. I have a solid chance at pursuing a professional level of competition but currently I am more excited about the success of this 2009 team. If baseball does not work out after this spring I hope to attend Graduate School at Springfield to study Athletic Administration and gain coaching experience. This game consumes me and I could never pull myself away from it. M: What are some of the advantages of being in D-III? B: Being in D-III, our coaches and athletic administration put education first. There is no excuse to miss class or homework for something like practice. Exceptions are made on game days but our schedules are formed around classes so we get the most of our education. From an athletics standpoint there is a great degree of humbleness to our approach of the game. For most, this is our last chance to compete and we take a great deal of pride in doing so as a team. M: How do you feel you have developed through your college career compared to where you were when you graduated HS? B: In HS I was just learning how to pitch, and most of my success came from my velocity. Now that my velocity is only average, I have really developed as a guy who depends on movement and off-speed stuff to get hitters out. My biggest accomplishment must be in my attitude though, Coach Podbelski along with team leaders through my years here have really influenced how I react to and approach adversity. I am very emotional about this game but I have learned to channel most of that emotion into my success. M: You pitch in a great program, how much fun is baseball when you a part of a winning team? B: Being a part of a successful program is nothing but enjoyable. As a team we show up each day knowing that our chance to win a game is high, and that if we stick to the game we play and trust our stuff we can come out on top. The best part has to be that other programs are really gunning to take us down. M: Have you had to battle though any injuries or have you been pretty healthy? B: I had a torn labrum that I pitched through my junior year. 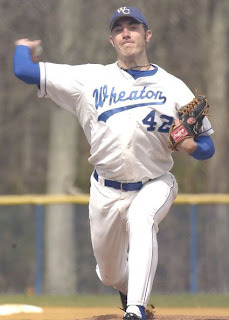 I had surgery on it after my summer season with the Saratoga Phillies, took a year off from Wheaton and am now back at Wheaton as a 5th year Sr. and I (feel) very healthy. M: You get to play at USM once in awhile do you get your own cheering section to come down from Gray-New Gloucester? B: We will be visiting USM on the 19th of April and I personally invite members of my community in Gray to attend. Right now we are ranked 2nd in the Nation and USM is ranked 8th, which poses an interesting match-up between regional opponents. M: What is your out pitch, and who are some of your pitching influences through the years? B: My out pitches are my sinker and a two seam fastball that moves down and in to a right-handed hitter. I take a lot of pride in getting as many ground ball outs in a game as possible. (21 is my personal best). Strikeouts are limited in my approach, but when I do strike someone out it is usually because I got them off balance with my slider or change-up. Through college I have had many influences, Coach Podbleski, the alumni of '05 '06 '07 'and '08 current teammates, and most of all my parents, all of which are influences on my drive to pitch well. As for MLB players I like to pick and choose attributes from different players that I mold my game around.